I finished this quilt last year and gave it this name of Folklore because many of my scraps were coming from a line of fabrics called Folklore. I selected those rather strong colors to make a dramatic effect, which is quite unusual for me, as in general I prefer soft tunes. I was influenced by a picture found in an old magazine : Country Quilts of Fall 2005 and I used their pattern. 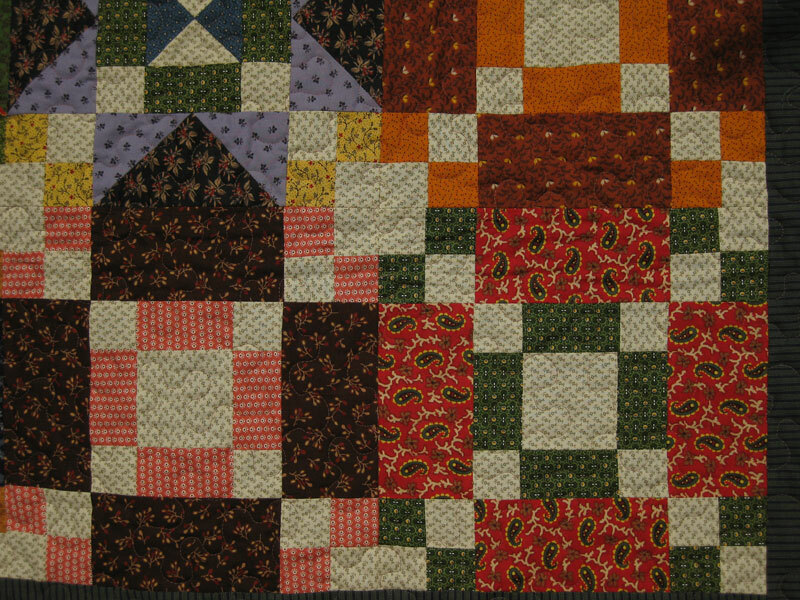 The pattern names of the blocks are Puss In The Corner and Stepping Stars. The quilt size is 63" x 75". (1m60 x 1m90). 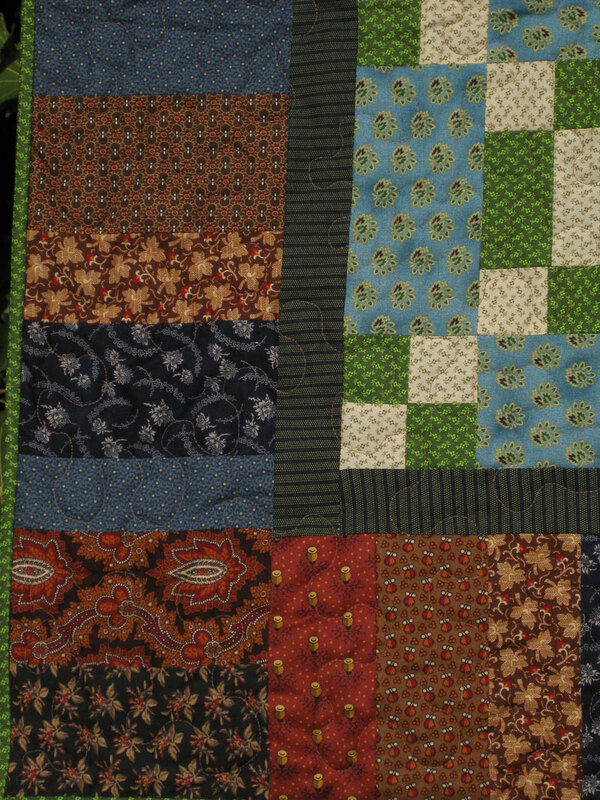 As I said before, I was not used to work with such strong tunes and the consequence was that, once finished, I folded my Folklore quilt and put it straight in a cupboard. I did not look at it for a whole year! But when I "re-discovered" it this autumn, I fell in love with it!!! I find those cheerfull and warm colors so attractive and I think it makes a perfect decoration for fall. Everybody can now admire it in my lounge! 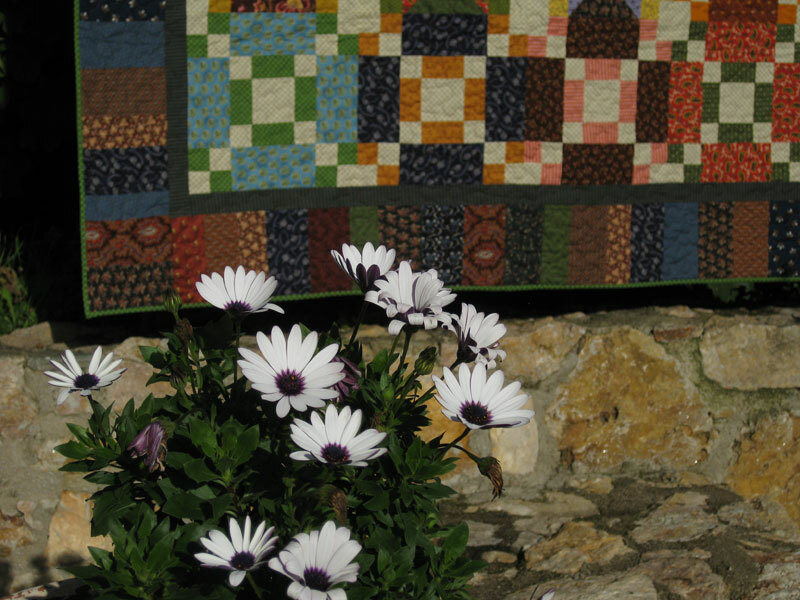 Ce quilt est splendide! Félicitations! sûrement du bien de sortir de temps en temps de nos chemins battus! Merci Helen! Il est vrai que c'est stimulant de se forcer de temps en temps a de nouvelles experiences! Oh Christine, this is lovely! The colors are so rich and perfect for this time of year. I'm so glad you rediscovered it and shared it. 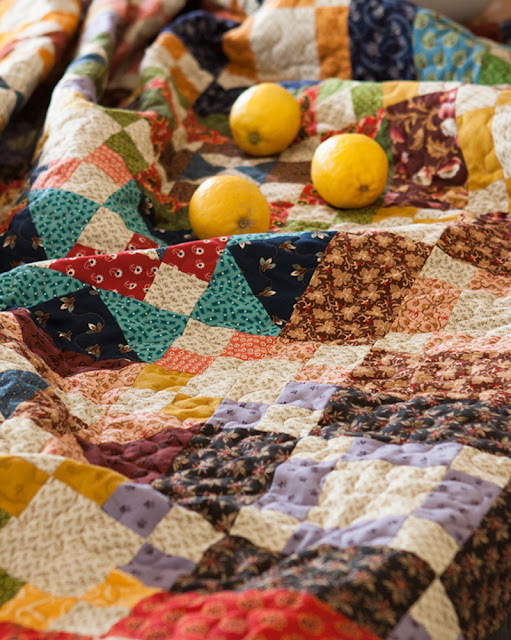 As always, your photography is just as special as the quilt. You inspire me! 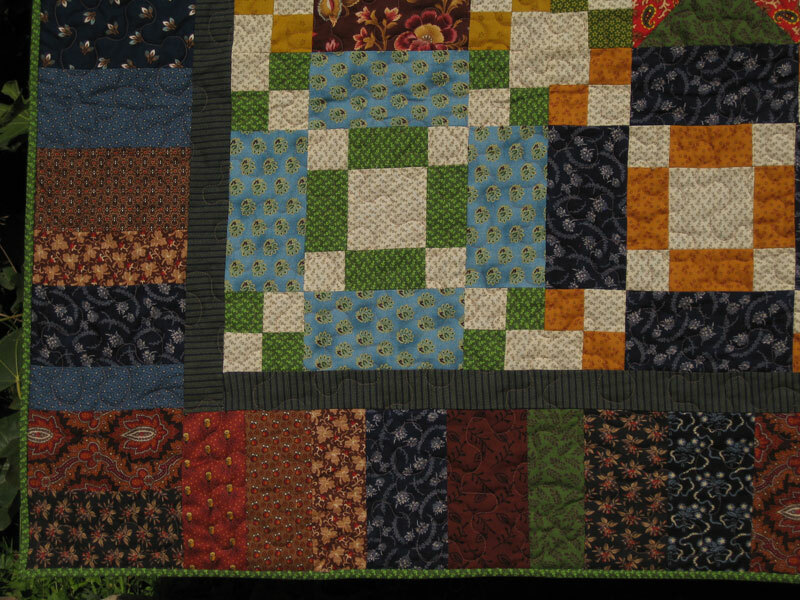 it is a beautiful quilt - the colors may be darker than you normally work and that might be why it had to grow on you? That happened to me with a quilt I made some years ago now - it was very dark with lots of browns, gold, other dark colors - I gave it to my brother and now miss it sometimes! Can you tell how much I LOVE this quilt? Great scrappy quilt. I love those pretty daisies in the pot too. This is so beautiful!! Could you write up a tutorial or give a few tips? I would love to make one lie this, but am only a beginner quilter. 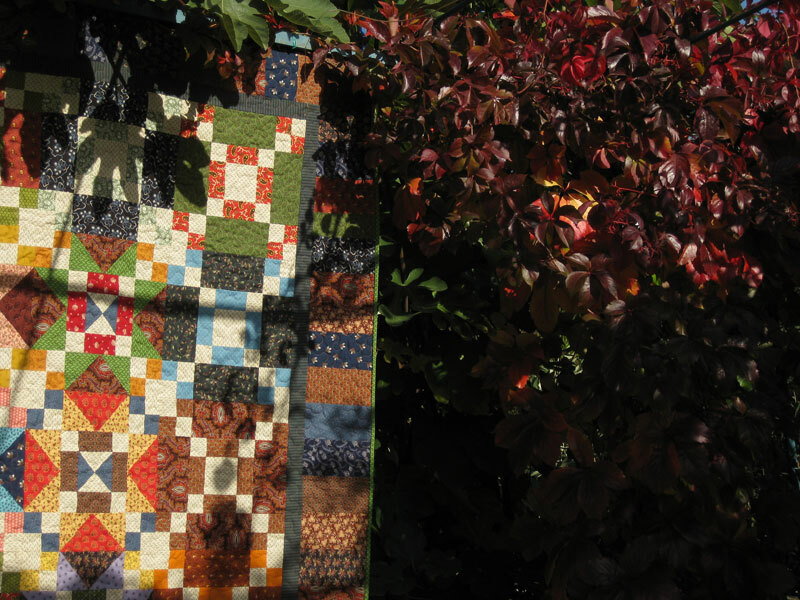 Christine, this is a quilt right up my alley! (That means that I LOVE it!) I love warm Autumn colors and scrappy quilts and your sis the best! Puss in the corner is such a good block to combine with others, always making interesting secondary patterns. 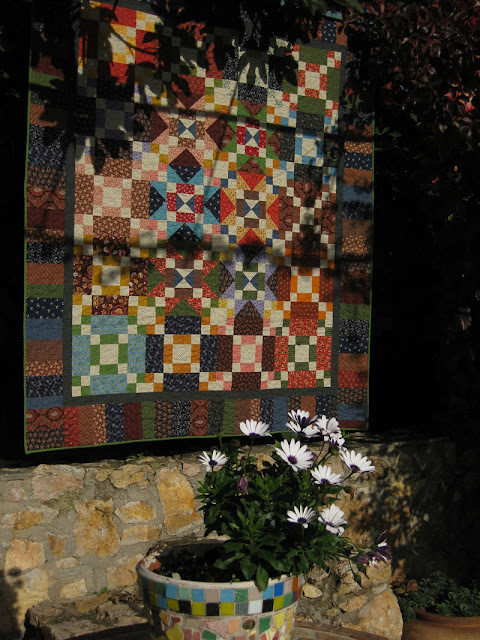 Encore un quilt magnifique !! on n'arrive plus a te suivre... encore une fois le talent de l'artiste pour associer les couleurs est la et le resultat est surprenant....Adorable !! Gorgeous pictures of this rich, beautiful quilt, Christine. Love the indoor ones with the lemons! Looks like a great quilt for relaxing and snuggling in the lounge. Happy Sunday! Je comprends que vous soyez tombée "amoureuse" de ce quilt !! Il est trop beau avec ses couleurs qui donnent du pep's !! Je le verrais bien aussi réalisé en flanelle pour l'hiver ! 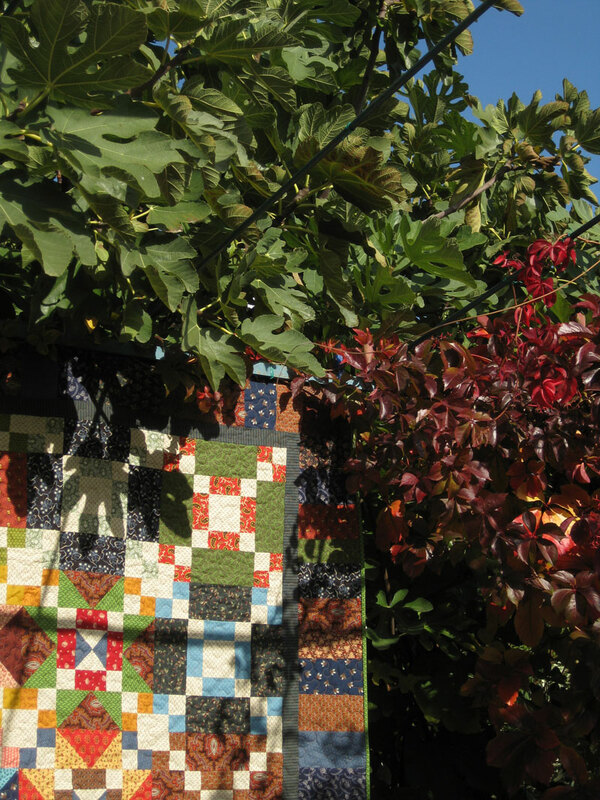 Great autumn quilt. Looks splendid with lemons. My kind of quilt. Lots of different fabrics all playing together so nice. I love the warm autumn colors and mix of patterns. Au début vous ne l'aimiez pas trop , il est pourtant si beau ! Vraiment J'ADORE ce quilt moi aussi ! Formidable utilisation de nombreux tissus, variation super-intéressante de différents blocs... Bravo Christine ! Just discovered your blog through Throw Back Thursday. And I'm so glad I did! This is such a beautiful quilt (it's my colors, so if you really don't like it, I'll be willing to take it). And your photos are lovely. It's such a nice quilt -- I'm glad you like it better now!! 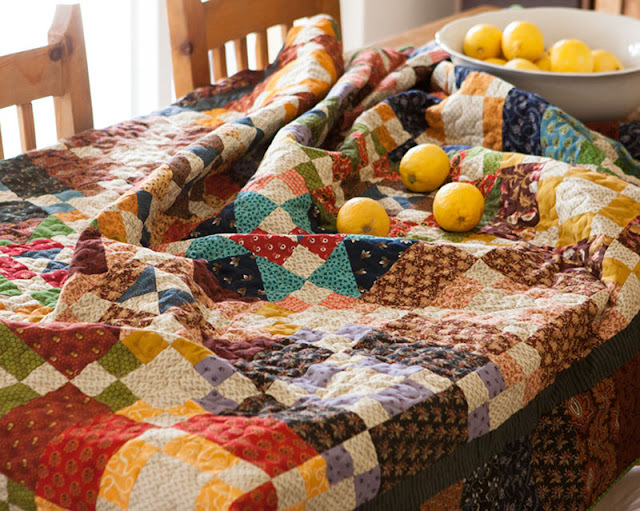 Beautiful quilt - beautiful pic on the table too! 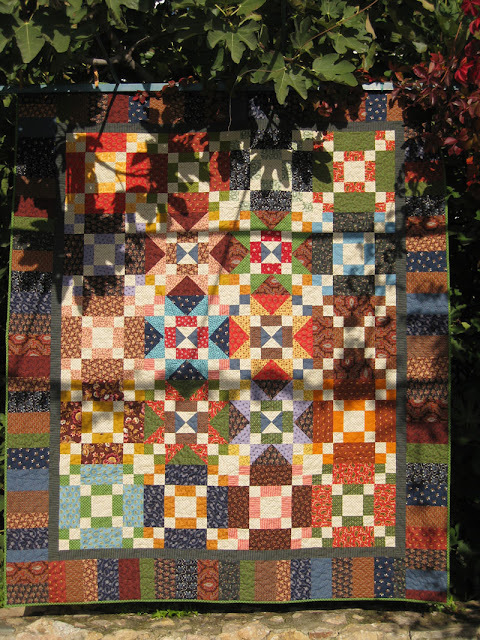 This quilt is so striking! It caught my eye right from the thumbnail on the link up. When I opened it and saw that it was Civil War prints I loved it even more. Thanks a lot! We both love Civil War prints! What beautiful fabrics. It is always a nice change of pace to try out someone else's color palates from time to time. 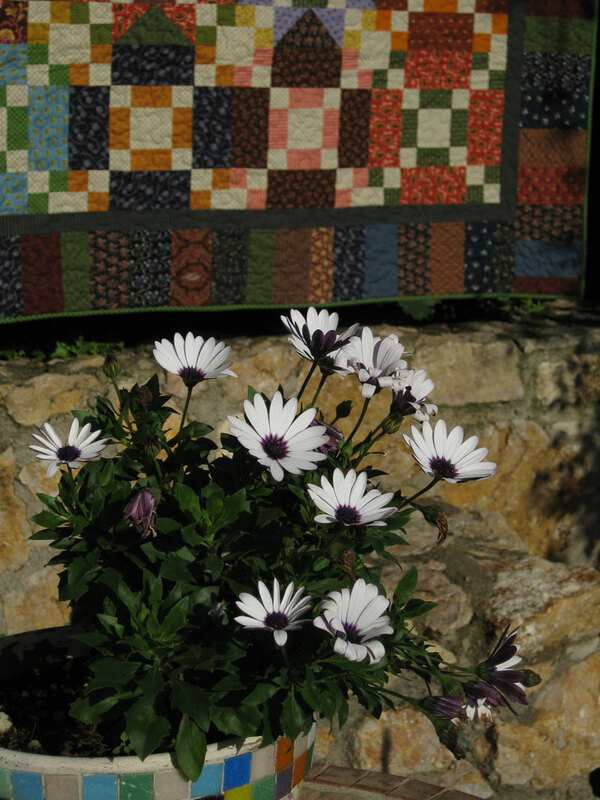 What a wonderful quilt and I love how you have done the photography with it. Lovely! So nice to see all the pretty fabrics in the quilt. Great photos. Great work. 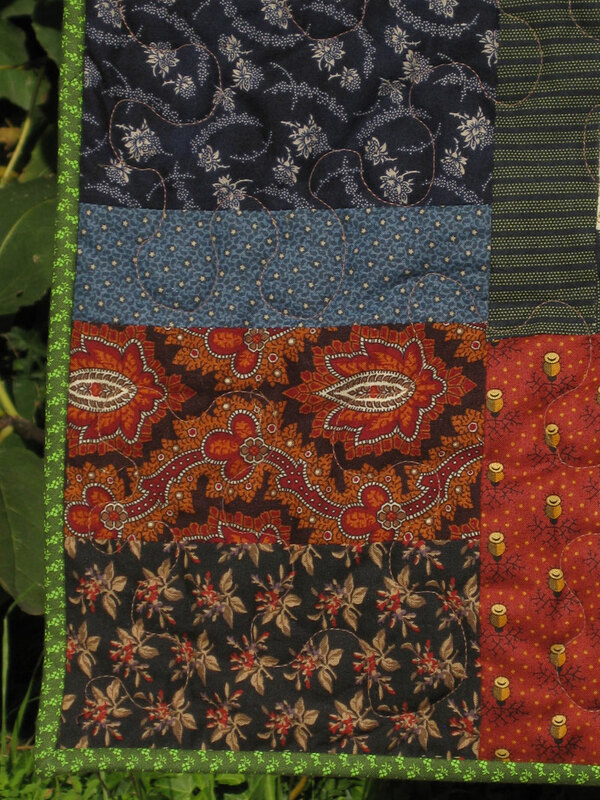 Lovely collection of beautiful fabrics in a great pattern. Deliciously scrappy - just wonderful. LOVE the way you photographed it!! It's beautiful! What a wonderful setting. Thank you for sharing pictures.